Recipe Review: Lemons. For God's Sake, Lemons! Lemons. For God's Sake, Lemons! .39 cent lemons at HyVee this week according to the ad. *shudder* You can't tell just looking at your screen, but that was definitely a shudder of pleasure. I flipping LOVE lemons. They are so versatile (use them for cleaning! ), delicious and they smell like what I hope heaven smells like. Really, any citrus fruit tends to trip my trigger, but lemons in particular. And next week, I'll be using a ridiculous amount in my dinner menu. Orange chicken, pineapple chicken stir fry, citrus and herb stuffed Cornish game hens... I'm going to be in hog heaven. Last weekend, the citrus drive was hitting me hard. Milo had gone into his room for some quiet time (he likes to sit and "read" through his books), so I started browsing my Pinterest page in earnest. Almost at the bottom of my Breaking the Fast board, I found the solution to my problem : Lemon Baked Mini Donuts. Now, I haven't spent much time exploring Mrs. Schwartz's blog, but if her other recipes are as good as this, you can bet they'll be featured on here again! Like a crazy person, I started flying through my cupboards to see if I had all ingredients on hand... CHECK! So I began. First, I put all my wet ingredients into my mixing bowl. See that lemon zest in there? YUM. Boring, I know. Let's get to the fun stuff! That is a HEAVY ceramic bowl. Self, I think we can get away with piping this dough onto a cookie sheet in the shape of a donut. We'll leave some room for expansion and resign ourselves that it may not be pretty, but it'll darn sure be tasty. Okay? Okay. Yes, that's exactly how that went in my head. So! I used one of my biscuit cutters as a circle guide and piped them out. I really need to invest in a donut pan. Um...okay. Yes. They look like something your dog would leave on the front lawn, but I was able to get past that because of the way they filled my kitchen with the magical scent of lemon. Oven time! At this point, Milo was done with his quiet time and wanted to know what the heck I was doing out in the kitchen without him. He wants to help! So, the first thing he did was toddle over to the oven to see what was going on. 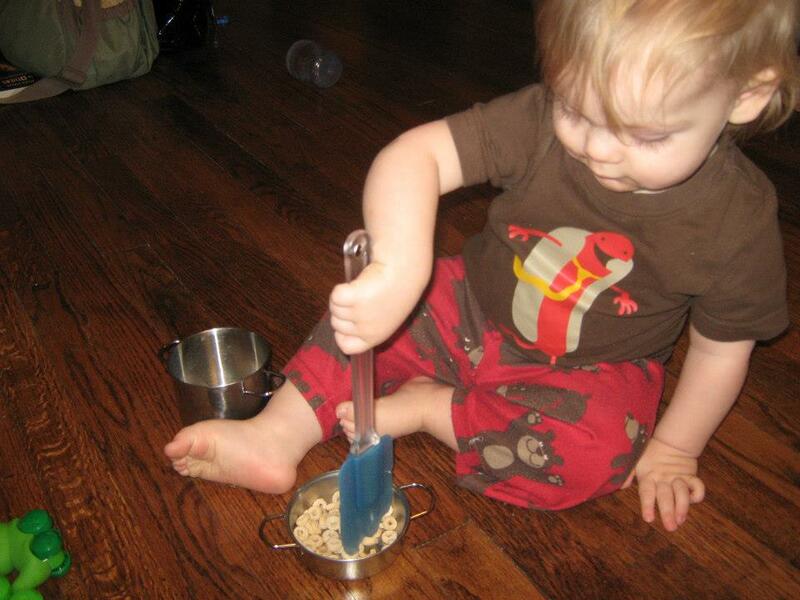 Once the contents met with his approval he ran over to the pan cupboard and brought out 3 different pans and started reaching his tiny fingers up for his "ingredients." At this point I handed him some minced onion, garlic powder, salt and pepper and a spoon. He proceeded to shake the spices into the pan and stir them around while going, "Sssssss," like mommy's pans do when she stirs things. While Milo cooked, mommy made the lemon glaze. There are no pictures of this step because I was constantly rotating Milo's ingredients to keep him happy. Both hands were definitely full. Anyhoo... since I was so busy, I didn't bother to check on the donuts until my timer went off. There is also no picture of them coming out of the oven because I was holding Milo off with one leg and pulling them out of the oven with both hands. Again, hands definitely full. However, here they are after I glazed them! I know. I know. Donut pan. Shut up. Okay, so yes, they spread out more than I thought they would. Yes, I need to invest in a donut pan. All this is acknowledged. But guess what? Shape aside, these things were AWESOME. The donuts themselves were light and fluffy, definitely not a cake donut consistency. Surprisingly, without the glaze, they weren't that sweet and didn't scream lemon at me. Oh, you could taste the lemon don't get me wrong, but in my heightened state of citrus need, I expected a slap of lemon across my taste buds! This was much more subtle. Then I dipped them in the glaze. HOLY LEMON PUNCH, BATMAN! The glaze sealed the deal for me. Milo devoured one almost immediately and shuffled off to start his hour long sugar high. Mommy may have had two. Or four. Who's counting? Preheat the donut maker or oven to 325. In a bowl, combine the flour, sugar, baking soda, baking powder and salt. Whisk until incorporated. Set aside. In a different bowl, combine the egg, lemon yogurt, milk, oil and lemon zest. Stir until combined. Add the dry ingredients and whisk until no longer lumpy. Spray the donut maker or donut pan. In a donut maker it will take about 3-4 minutes to bake. If baking in the oven and using a mini muffin pan bake for about 5 minutes but I can't guarantee this since I haven't tried it. If using a regular sized donut pan, bake for 10-12 minutes. If you're like me and don't have any of this, just keep an eye on them. Once the bottoms turn just a little brown, take them out! While the donuts bake, combine the powdered sugar and lemon juice. Stir until combined. When the donuts are fully cooked, remove them from the maker/pan and place on a wire rack. After they are almost all the way cooled, dunk in the glaze and place back on the rack to drip dry.